Diamonds, a girls best friend. Not that they dislike guys though... This helix piercing found a way to combine the fame and glory of gold with the sparkles of diamonds in a truly unique way. That this helix doesn't hold a real diamond is a bit obvious and also unnecessary. This Cubic Zirconia manages to do just fine in what it does best, creating stunning shine. 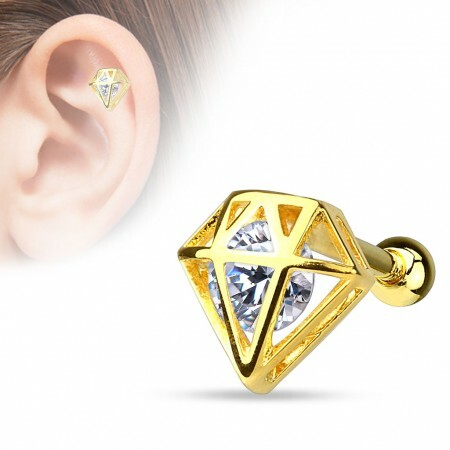 This piercing knows how to use the sparkles of the crystal in such a way that they almost seem to come from the gold. Since the backside of the crystal is left open, the light can easily find its way there. This you will see in the amount and the strength of its sparks.